It’s no secret that as a nation us Brits love our pets, sometimes more than our own kids! However, when it comes to kitting out your home, both can pose as a bit of a problem. This is no exception with flooring and it can leave you feeling pretty limited when it comes to choice. Now, many experts would probably advise that you stay away from real wood flooring and play it safe with laminate or vinyl. However, if you’re someone who is looking to achieve that ever-increasing popular ‘rustic’ look and are able to deal with the odd dent or scratch then real wood might be the one for you! Oak is an incredibly popular choice when it comes to family-life. We all know how much mess children and pets can make, if you’re sick of plugging in the vacuum cleaner then why not consider Oak? It only requires a simple sweep and a once over with a mop (at a push), making it one of the easier to clean flooring options. Oak can withstand a lot of wear but if it does start to look dilapidated over the years then it can be re-sanded to bring back to life! Furthermore, Oak flooring does not collect dust or mould as easily as other floors, which makes it ideal if anyone in your household suffers from allergies. Another thing to consider is what type of finish you want your floor to have. There are two prominent choices; Lacquered and Oiled, both have their advantages and disadvantages. Lacquered flooring will definitely get scratched more often, however it is a lot more durable, easier to clean and will brave the challenge of a pet extremely well. On the other hand, oiled floor is harder to scratch, but the floor will need re-coating more frequently. The decision really depends on how committed you want to be when it comes to maintaining the quality of your floor. There are a few things that you personally can do to ensure scratches are reduced; maintaining the length of your pet’s claws is one of the obvious ones. Also, add extra protection by laying rugs/runners down in areas that see heavier traffic from both humans and pets. 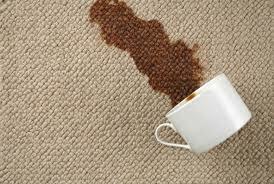 As with all flooring, if you do have any mishaps or spillages then try to clean them up as soon as possible to avoid stains and marks from occurring. So there you have it, just a few reasons why Luxury Flooring think that the real thing is the best for your family home! One of the problems with living in a rented house is that we’re very much at the mercy of our landlord when things need fixing. Largely, he’s pretty good and he’ll send a tradesman over to sort things out, or attend to it himself if he’s in the country. However, there are certain things which aren’t seen to in such a timely fashion, such as our truly, completely grim living room carpet. When we moved in, the landlord had refurbished the house, removing the old laminate and replacing it with new carpet. Now, this might seem like a nice thing, having brand new carpet in a rented house, but in our case it was a curse. You see, our landlord chose a beige patterned carpet, knowing at the time that we had a toddler and a dog, and that the patio doors in our living room were the only way to get in an out of the garden. Skip forward three and a half years and our carpet is looking less beige and more ‘interesting collection of stains’. If Husband and I owned the house, we’d replace the carpet with cheap laminate flooring, which would solve so many problems – it would be easy to keep clean, it would look SO much nicer than what we have now, and it would save our nerves from jangling every time Chuck comes in from the garden in the winter and we have to quickly try and clean the mud off of his feet before he steps on the carpet! I’m by no means innocent myself. I’m terrible for leaving drinks on the floor and then inevitably kicking them over as I weave my way through the house like a bull in a china shop, which means several of the stains can be attributed to me. Luckily, I’m not a big drinker, or else red wines stains could have made the situation a whole lot worse! We’ve asked our landlord if he could think about replacing the carpet with laminate, as we’ve lived here for a while now and aren’t planning on moving any time soon, so hopefully he’ll see sense and sort it out for us, but I can understand why he’d be reluctant to do so, this close to Christmas. All I know is, between my drinks, Chuck’s muddy feet, Sausage’s melted crayons and Husband’s…well, actually, no, Husband is the one innocent party on all of this; something needs to change, because the thought of a baby crawling on our carpet (despite the fact that we’ve had it professionally cleaned TWICE!) is not one that appeals to any of us.